Conference On Health Care Looks At Innovative Ways To Make Things Better In The Developing World : Goats and Soda So that's one way to improve health care in the developing world. Here are some other bright ideas from people who like to shake up the status quo. 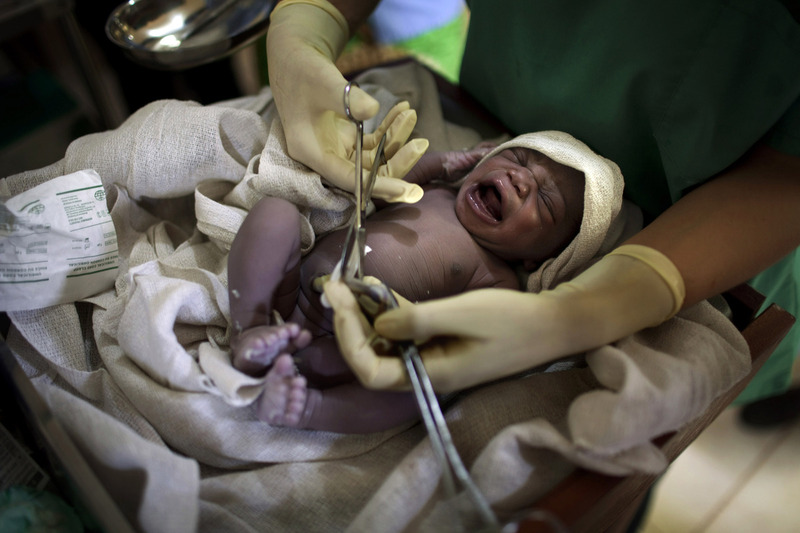 A midwife cuts the umbilical cord of a newborn baby in a hospital in South Sudan. Don't forget to follow up: In the past, if a malnourished child had been admitted to a health facility, he or she would have been treated and that would have been the end of it. Now there's a referral system to connect that child's family to a program that will provide food. There are also government employees based in communities to provide items such as insecticide treated nets and contraceptives, and each of these folks has a community register. "When a woman delivers, her baby is added to the register," Chibawe says. That way, community workers can check in and recommend check ups. Bring in the chiefs: Looping in local leaders makes it easier to get messages out, Chibawe says. By helping chiefs identify problems (and solutions) in their villages — like water sources that will reduce the prevalence of diarrhea — the government has been able to enlist their assistance in other matters. "Zambia has a problem of women delivering in homes," Chibawe explains, citing complications such as bleeding after delivery, infection and obstructed labor. "So the chief gives a directive that he doesn't want anyone delivering in the village. They'll be charged a cow or a chicken." Expert: Cezary Bednarski, an architect and director of London's Studio Bednarski Ltd.
Go to "eco-towns": In Angola, a country that's been plagued by dumb design decisions, much of the new housing created since its civil war ended in 2002 has been located in areas with dull, confusing layouts. Bednarski's Eco-Towns mimick a city environment, mixing residential units with commercial activity and weaving green, public space throughout. That gets folks walking, which is critical for health, and it keeps eyes on the streets. "So crime rates are lower and everything is more civilized," he explains. Don't let the sun in: In some parts of the world, people want all the sunlight they can get. In Angola — where the sun is often too bright and too hot — it's just the opposite. Put the windows in the wrong place, he says, and "people will pull all of the blinds down and turn lights on." Planning a street pattern that takes solar rays into account is good for residents, who will be more comfortable. It's even better for the planet, as it reduces the need for electricity. Get the counsel of councils: To improve the quality of life, Ecuador is setting up National Equity Councils — a 50/50 mix of appointed officials and citizens nominated by non-governmental organizations. They come from the country's new constitution, which is based on the idea of "sumak kawsay" — Quechua for "good way of living." Each council considers a specific issue, such as gender, ethnicity and disability. Their job is to examine proposed policies and determine the impact on people today and in future generations, Chiriboga says. "The idea is that ministries have to take these groups into consideration," he explains. "For each law, they have a say."